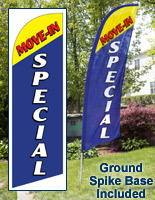 The Move-In Special Flag is One of Many Banners for Sale on This Site! 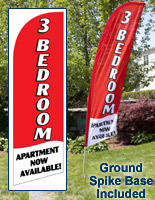 An Aluminum and Fiberglass Pole Allows This Banner to Flutter in the Wind! 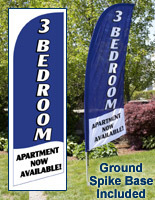 Each Move-In Special Flag is 8 Feet Tall, Ideal for Placement In front of an Apartment Complex! 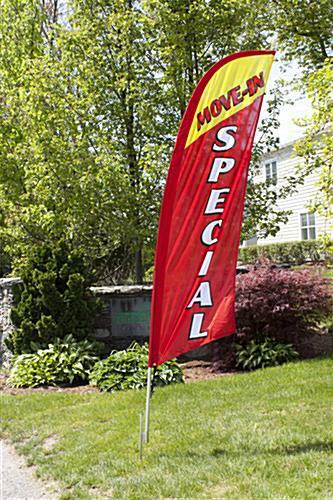 This MOVE-IN SPECIAL flag that flutters is portable, affordable, durable and most importantly effective at getting vacant properties filled fast! Standing 8' tall once placed on the ground stake, these outdoor displays have a classic feather shape and colorful design that potential renters and buyers will find welcoming. 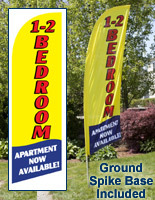 This real estate MOVE-IN SPECIAL flag has text in two different color schemes; white on red and red on yellow. These color combination are easy to read from a distance, and very welcoming to draw potential buyers to the property. A knitted polyester construction allows each swooper banner to flutter in the most moderate of wind conditions. 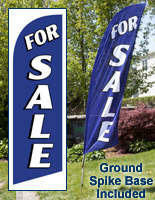 This outdoor display is a MOVE-IN SPECIAL flag that includes a ground spike base to offer realtors and property managers the most flexibility in where they strategically place the banner. Advertisers can repeatedly hammer the ground spike into the lawns of vacant properties due to durable steel construction. 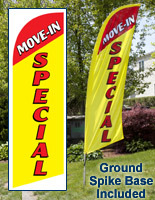 The most effective locations to place this MOVE-IN SPECIAL flag for apartments is in the front lawn of a home, along the entrance to an apartment complex or in front of a rental office. A carrying case comes with each unit to make transport and storage a simple task. Each MOVE-IN SPECIAL flag that comes with a bag weighs only 4 lbs., so virtually anyone can carry the unit. Inside the bag, there are individual compartments for the pole sections, ground spike and blade banner. The pole disassembles into four sections; (2) aluminum and (2) fiberglass. 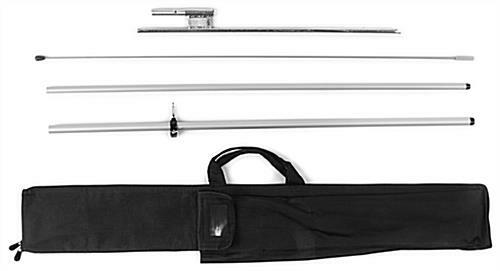 The MOVE-IN SPECIAL flag that comes with a bag also bows in the wind due to the top two sections of pole having a fiberglass construction. Constructing the bottom pole sections from aluminum helps reduce the overall cost of the unit. Once all components of the MOVE-IN SPECIAL flag are loaded into the bag, it measures only 48"w x 9"h x 2"d. The compact size makes storage and transporting the unit possible in the trunk of care. Only one person is required for assembly of the MOVE-IN SPECIAL flag, which takes approximately 2 minutes when hammering the stake into the ground is factored in. Once assembled, a bungee cord attaches the blade banner to the carbon & aluminum pole so the pennant does not fly off when the wind gusts. 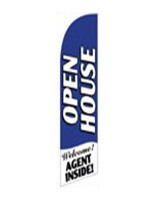 The combination of 8' height, classic feather banner shape and vivid color scheme enables this display to generate an increased number of leads for property managers and realtors. 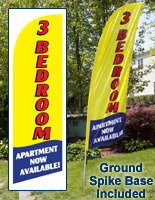 Yet, the ingeniously design keeps the cost of these swooper banners low enough they are an incredible bargain!